The influence of culture on economic decision-making is well established in the literature. Recently, there has been a growing interest in the role of cultural proximity on trade flows between countries. Sharing a common language or a common religion fosters trade flows. Yet, while the positive effect of sharing common cultural traits on bilateral trade flows has been abundantly confirmed in empirical trade analyses, the possible role of cultural proximity in times of crisis has not been raised in the literature until recently, in spite of the launching of initiatives aimed at strengthening trade relationships and reinforcing economic solidarity during crises among countries sharing a common cultural heritage such as the Francophonie Economic Forum. 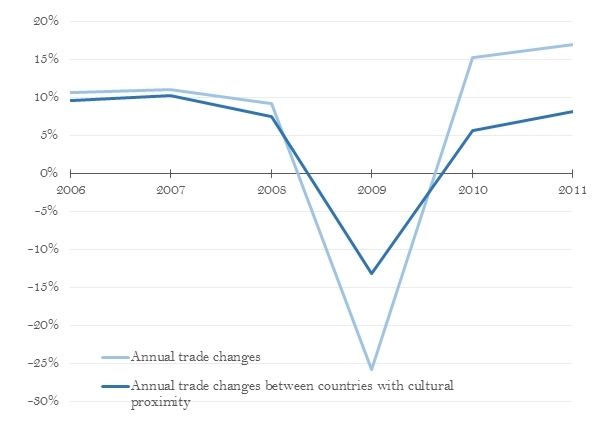 The figure above illustrates a lower collapse of trade flows among cultural close countries during the financial crisis. Intrigued by this observation, Céline Carrère and Maria Masood investigated further the influence of cultural bond on bilateral trade flows in a recently published economic analysis. 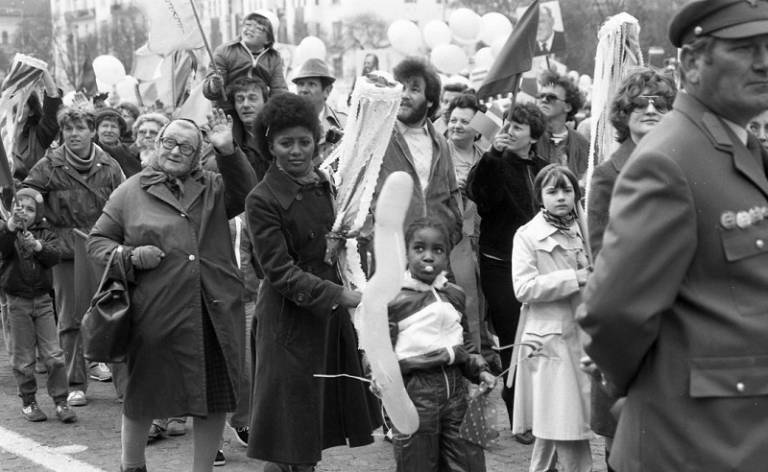 The study confirms the alleviating role of cultural proximity in times of crises. Based on a sample of 140 countries over the 1995-2015 period, the authors uncover the existence of a significant surge in the different dimensions of cultural proximity (namely, common language, common colonial history, a same origin of the legal system and religious proximity) during an economic recession. The estimated impact of different proximity variables on trade are summarized in the figure below. Note: The figure reports the % change in trade induced by each variable during a recession, with the associated 90% confidence intervals computed with country-pair clustered standard errors, all other things being equal. The % change is computed as the exponential of the associated coefficients (minus 1) – corresponding coefficients are reported in table A3 in the annex A2. CL refers to common language and RTA to Regional Trade Agreement. More specifically, sharing a common language provides a better resilience of trade flows of around 11 % when both countries experience an economic recession compared to the “normal” (i.e. non-crisis) impact of common language on trade. This is an extra-effect, crisis-specific, in addition to the already favored trade relationships these countries have in non-crisis period, all other things being equal. And the same conclusion applies for the other variables of cultural proximity. Sharing a common colonial past corresponds to a better resilience of 17% and sharing a common religion 9.5% during crisis. 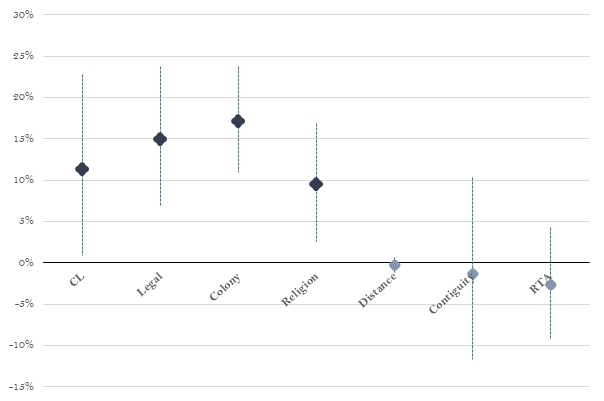 Interestingly, it seems that this resilience effect is attributable to cultural proximity but not to the other proximity variables such as distance, border contiguity or being part of a same trade agreements. The analysis also rules out that this effect is driven by a change in trade composition. Then, what can explain the surge in the influence of cultural proximity on bilateral trade flows in times of recession? Based on a literature review, the paper discusses several economic mechanisms that are can be at play. First, cultural proximity may have a critical role in reducing adverse selection and moral hazard that arise in times of economic turbulences. Considering cultural proximity as one of the determinants of trust among trade partners, this can explain the lower collapse of bilateral trade flows of culturally close partners. Another venue for explaining the surge in the positive effect of cultural proximity focuses on the behavior of consumers. Some economists have emphasized a shift in consumers’ behavior toward ethnocentric stance and “animosity” against foreign products during the economic crisis. Yet, the increased reluctance to buy foreign products tend to be mitigated for products originating from culturally similar countries. Hence, these pieces of evidence altogether suggest that trade flows among culturally close country pairs should have suffered less from the economic crisis. C. Carrère and M. Masood, Cultural proximity: a source of trade flow resilience?, (2018). The World Economy, vol 41(7), 1812-1832. Maria Masood Dechevrens, Economist and Lecturer, FEGEMS and Université de Genève. Céline Carrère, Professor, Université de Genève, FERDI and CEPR, Geneva, Switzerland.